Naomi Traimer’s spinning ring is a touchable reminder that love makes the world go round. It's all you need. It always wins. It makes the world go round. We're talking about love, but Naomi Traimer's spinning ring actually shows it. 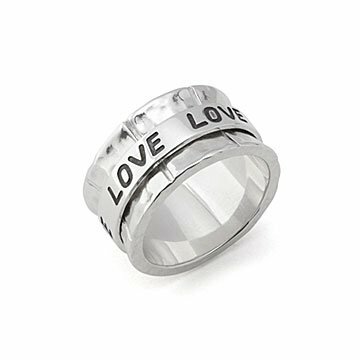 With the word "love" stamped around the ring's entire circumference, Naomi's design is a touchable reminder to spread joy and positivity. Inspired by Tibetan prayer wheels–which encourage the accumulation of wisdom and release of negative energy–the inner circle of the sterling silver design moves while the outer circle stays stationary against your finger. Wear it as part of your daily mediation, or as a way to find calm when you're feeling fidgety. Handmade in Thailand. Wipe gently with anti tarnish soft cloth.